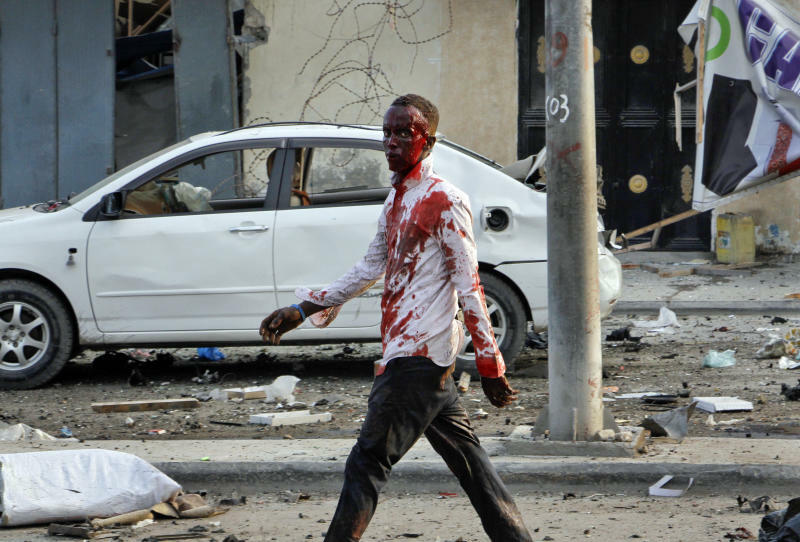 MOGADISHU, Somalia (AP) — Four car bombs by Islamic extremists exploded outside a hotel in the capital, Mogadishu, Friday afternoon killing at least 20 people and injuring 17, said police. 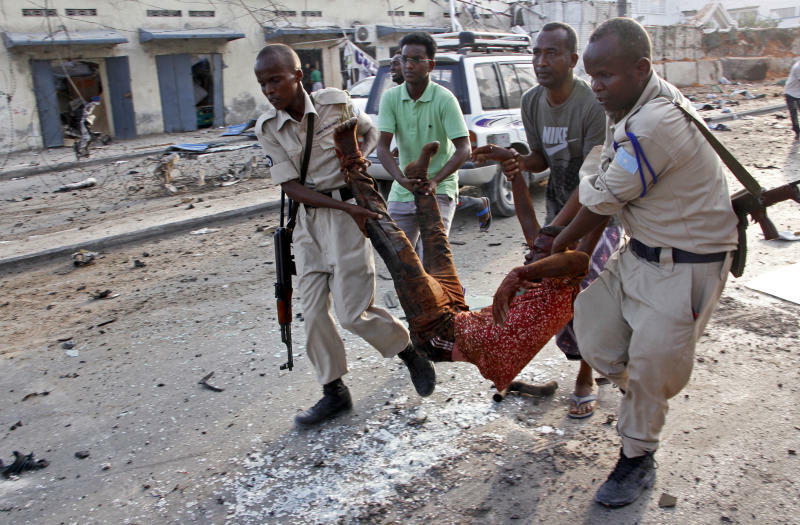 The suicide bombs detonated near the perimeter wall of the Sahafi Hotel, which is located across the street from the Somali Police Force's Criminal Investigations Department, said Capt. Mohamed Hussein. Somali security forces shot dead four gunmen who tried to storm through a hole blown into the hotel's wall but did not succeed in entering, he said. 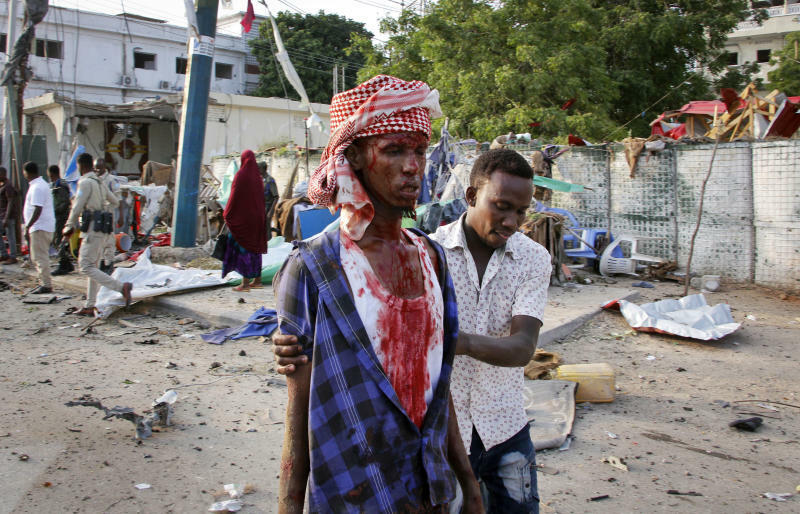 "The street was crowded with people and cars, bodies were everywhere," said Hussein Nur, a shopkeeper who suffered light shrapnel injuries on his right hand. "Gunfire killed several people, too." Somalia's Islamic extremist rebels, al-Shabab, claimed responsibility for the bombs, according to the group's Adalus radio station. Among the dead was the manager of the Sahafi Hotel, whose father was the owner of the hotel before he was killed in an al-Shabab attack on establishment in 2015, said police Capt. Hussein. Guled reported from Nairobi, Kenya.